Carne con Papas translates to beef with potatoes. It’s a popular Cuban dish, and like most Cuban food, it’s made with simple, affordable ingredients. 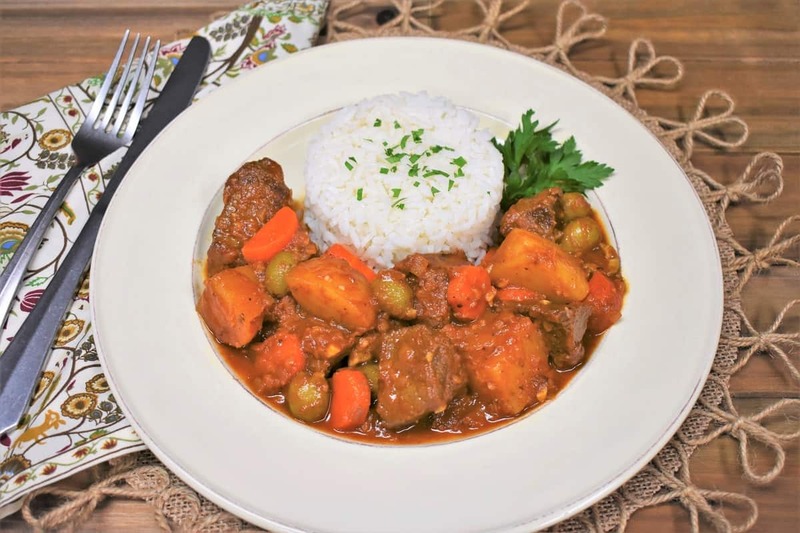 The ingredients in carne con papas are similar to what you’d put in a beef stew, but it is saucy instead of soupy. What kind of beef to use in carne con papas? Typically, the recipe calls for an inexpensive cut of beef that’s cut into small chunks and braised in a rich and flavorful tomato sauce until tender. In this recipe we use beef round. It’s flavorful and becomes tender (enough) with the cooking time. If you use sirloin, the meat will be softer. However, you’ll pay a little extra. What else goes in carne con papas? Potatoes are always added to this dish. After all, they’re in the name. The rest of the ingredients depend on the cook. 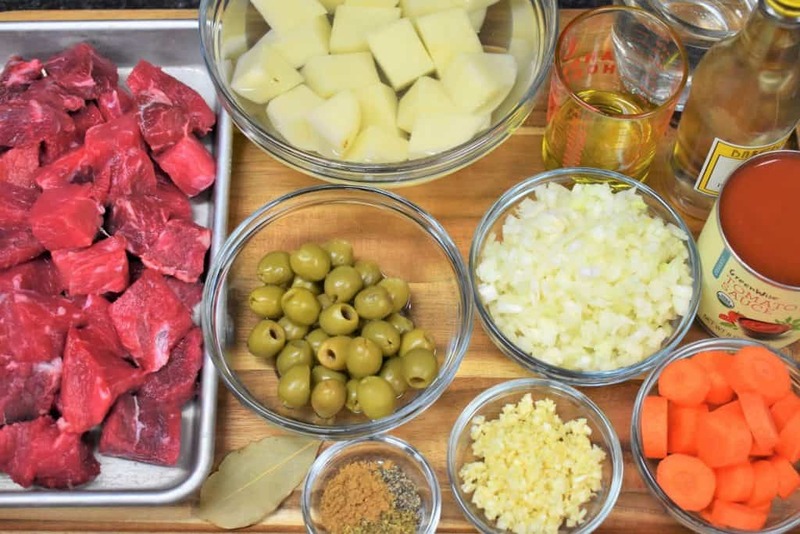 In this carne con papas recipe, we add carrots and olives. The carrots add just a touch of sweetness, and the olives add a salty bite; such a great combination! 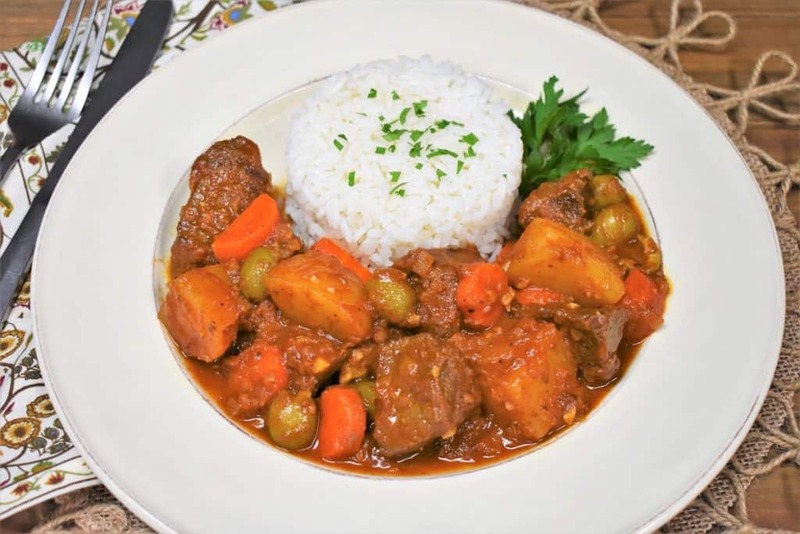 Serve the carne con papas with white rice for a traditional, down-home Cuban meal. If you’re thinking, rice and potatoes at the same time? In the same dish? Yes, it’s a Cuban thing! 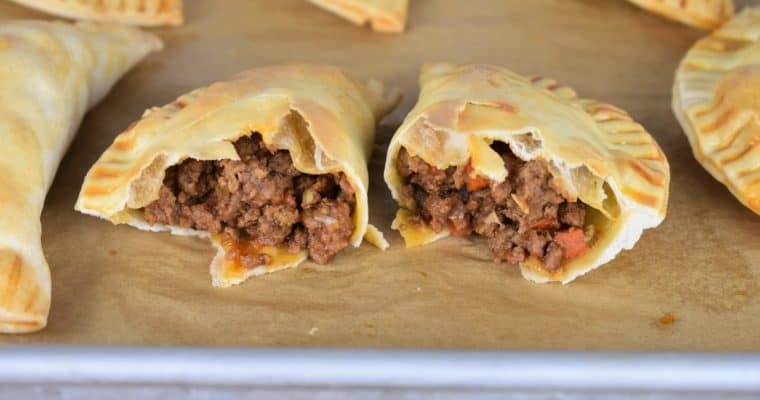 If you’re looking for more Cuban comfort food, give one of these a try! If you buy the beef already cut into pieces, check that they’re all roughly the same size. Cut any larger pieces. Season the beef with the salt. Peel and cut the potato into 1-2 inch pieces. Don’t cut them too small so they hold their shape during the cooking time. Once the potatoes are peeled and cut, place them in a bowl and cover them with cold water until ready to use. 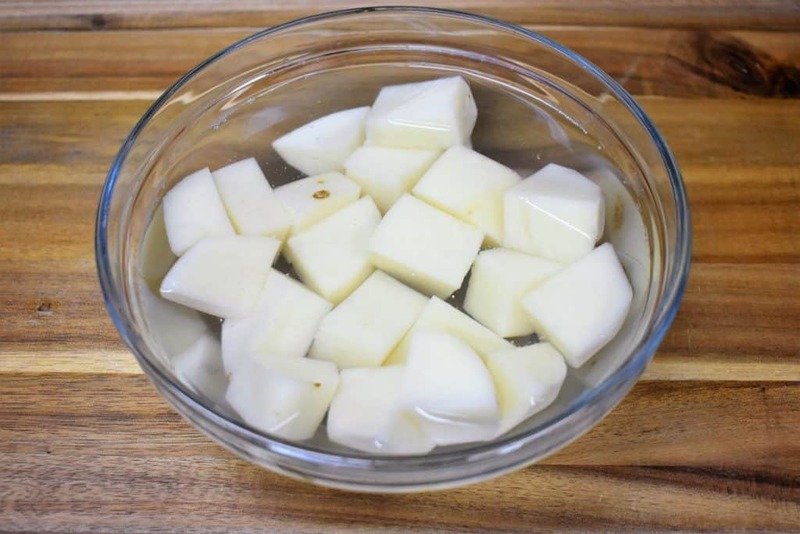 Peeled and cut potatoes brown quickly, the water will slow down this process. Just remember to drain them before adding them to the pot. Yes, I have forgotten. Yes, it was a mess! Dice and slice the onions and carrots. Mince the garlic and measure out the rest of the ingredients. 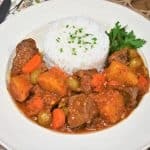 If you’re planning to serve the carne con papas with white rice, get it going before, or soon after you start cooking. That way the rice and main dish will be ready at the same time. Heat the olive oil in a large pot over medium heat. When the oil is hot, add the beef. Arrange the beef in the pot so that it’s in a single layer. Cook the beef chunks for about 5 minutes. Then turn each piece and cook for another 5 minutes until browned. Remove the pot from the heat. I just slide it over to an empty burner. Then remove the beef from the pot and place it on a plate or pan. Keep the meat warm by covering the plate loosely with a piece of aluminum foil, and/or place the plate in the microwave or oven. The beef will stay warm away from drafts. Don’t worry that it’s not cooked through; it will finish cooking in the sauce. Do not wash the pot. Place it back over medium heat and add the onions. Cook the onions for 3-4 minutes until they start to soften and become translucent, stirring frequently. Add the garlic, cumin, oregano and pepper. Cook for 30 seconds to 1 minute, stirring almost constantly. Next, add the wine to the pot and stir while gently scrapping any bits off the bottom. Continue cooking until most of the liquid has evaporated – about 2 minutes, stirring frequently. Add the tomato sauce, water and the bay leaf to the pot and stir. Here’s a tip, I like to add some of the water to the empty can of tomato sauce, that way I get every last drop out. Now, carefully place the beef back in the pot, including any juices collected on the plate. When the sauce comes back to a simmer, lower the heat to medium-low and cover. Cook the beef for 15 minutes, stirring only occasionally. Keep the sauce at a simmer. If it’s boiling too vigorously lower the heat a bit, so the liquid doesn’t cook out. Uncover the pot and give the beef and sauce a quick stir. Then add the potatoes, carrots and olives. Cover and cook the beef and potatoes at a gentle simmer over medium-low to low heat for another 15-20 minutes, or until the potatoes and carrots are fork tender, stirring occasionally. If the sauce is boiling too vigorously, lower the heat just a touch. Remove the bay leaf and discard. Taste the sauce and add a little salt, if needed. As a reference we added ½ teaspoon of salt. Serve the carne con papas with white rice. Enjoy! 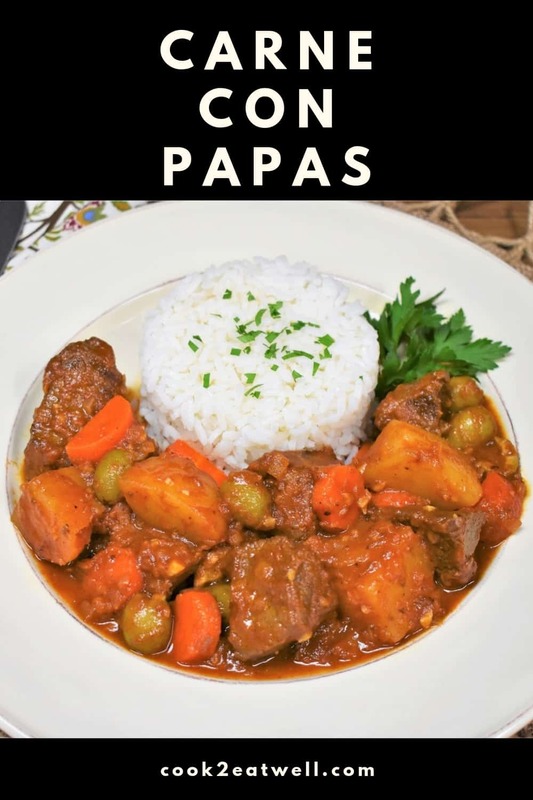 Carne con Papas is a Cuban comfort food favorite. It’s similar to beef stew, except that it’s saucy not soupy. Heat the olive oil in a large pot over medium heat, add the beef. Cook for 5 minutes. Turn each piece and cook another 5 minutes to brown on both sides. Remove the pot from the heat (I slide it over to an empty burner). Remove the beef from the pot and place on a plate or pan, tent to keep warm. Don’t worry that the beef is not cooked through; it will finish cooking in the sauce. Do not wash the skillet; add the onions. Cook the onions 3-4 minutes until translucent, stirring frequently. Add the garlic, cumin, oregano and black pepper. Cook for 30 seconds to 1 minute, stirring almost constantly. Add the wine to the pot and stir while gently scrapping any bits off the bottom. Continue cooking until most of the liquid has evaporated – about 2 minutes, stirring frequently. Add the tomato sauce, water and the bay leaf and stir. Add the beef back to the pot, including any juices collected on the plate. When the sauce comes back to a simmer, lower the heat to medium-low and cover. Cook for 15 minutes, stirring only occasionally. Keep the sauce at a simmer. If it’s boiling too vigorously lower the heat a bit, so all the liquid doesn’t cook out. Uncover the pot, give the beef and sauce a quick stir, then add the potatoes, carrots and olives. Cover and cook (simmering gently) over medium-low to low heat, another 15-20 minutes, or until the potatoes and carrots are fork tender, stirring occasionally. Serve the carne con papas with white rice, if desired. 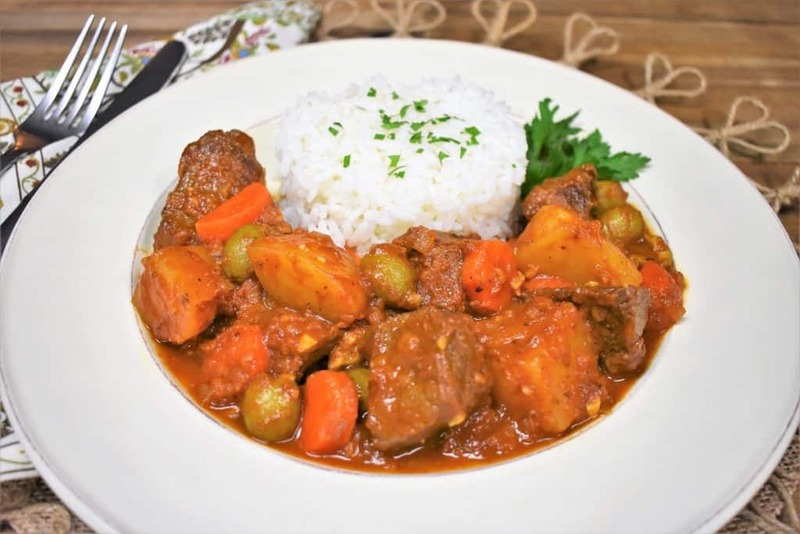 If you’re planning to serve the carne con papas with white rice, make sure you get it going before, or soon after you start. That way the rice and main dish will be ready at the same time. Add the water to the can of tomato sauce, that way you'll get every last drop out.